Steve Riley, the town manager for Hilton Head Island, is announced as Grand Marshal for this year’s St. Patrick’s Day parade. The Hilton Head Island St. Patrick’s Day Parade Committee announced Town of Hilton Head Island’s Town Manager, Steve Riley, as Grand Marshal for the Thirty-Fourth Annual Hilton Head Island St. Patrick’s Day Parade. The announcement was made at the traditional Grand Marshal Sash Presentation Ceremony held at Reilley’s Grill & Bar on Thursday, February 9. The parade is scheduled for Sunday, March 12, 2017 at 3 p.m. on Hilton Head Island’s Pope Avenue. Stephen G. (Steve) Riley came to Hilton Head Island in 1991 as community development manager, and has served as town manager since 1994. Previously, he served as a planner for the City of Beaufort and Beaufort County, and has worked as a private planning consultant. Riley has also served on many local and statewide boards of directors including the South Carolina Planning Education Advisory Committee; South Carolina Municipal Insurance Trust; Hilton Head Island Economic Development Corporation; Hilton Head Island Rotary Club; and the St. Francis School Board, among others. Riley hails from Omaha, Nebraska and holds degrees from the University of Nebraska and the University of Iowa. Last fall, Hurricane Matthew thrust Riley squarely into the public eye, thanks to his efforts in helping prepare the island before, monitoring and managing the situation during, and providing leadership with recovery efforts after the Category 2 storm. In January, Riley was honored with the Hilton Head Island-Bluffton Chamber of Commerce’s John Curry Tourism Award for his hurricane recovery efforts, which helped soften Matthew’s blow to the island’s tourism industry. He is the award’s first ever recipient not directly employed or involved in tourism. Parade organizers expect a record number of bands and marchers this year including marching bands from Groves, Savannah, Battery Creek, Ridgeland-Hardeeville, and Sol C. Johnson High Schools. Five pipe and drum bands from all over the East Coast will march this year as well: Ancient City (Florida), Wake & District (North Carolina), Charleston Pipe & Drum, Boston Police Gaelic Column, and CoastalCarolina Shields (South Carolina). The Marine Corps Band from Marine Corps Recruit Depot Parris Island also makes a return. The Planters Nutmobile with Planters spokesnut, Mr. Peanut, makes a second consecutive appearance, and the Oscar Mayer Wienermobile will also join in this year. Additionally, the Express Clydesdales of Yukon, Oklahoma will make their Hilton Head Island St. Patrick’s Day Parade debut. The team travels the land promoting Express Employment Professionals and raising millions of dollars for Children’s Miracle Network Hospitals. All will join the usual collection of colorful floats and marching groups from local businesses and non-profit organizations, and a procession of local dignitaries. The parade will follow its usual route, beginning at the south end of Pope Ave. near Coligny Circle and marching north to Office Park Road—site of the reviewing stand—where it will make a left turn and proceed to its end in front of Park Plaza and The Courtyard Building. 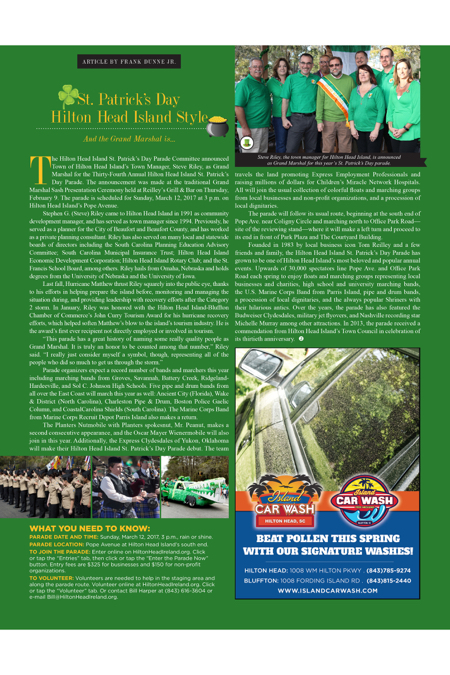 Founded in 1983 by local business icon Tom Reilley and a few friends and family, the Hilton Head Island St. Patrick’s Day Parade has grown to be one of Hilton Head Island’s most beloved and popular annual events. Upwards of 30,000 spectators line Pope Ave. and Office Park Road each spring to enjoy floats and marching groups representing local businesses and charities, high school and university marching bands, the U.S. Marine Corps Band from Parris Island, pipe and drum bands, a procession of local dignitaries, and the always popular Shriners with their hilarious antics. Over the years, the parade has also featured the Budweiser Clydesdales, military jet flyovers, and Nashville recording star Michelle Murray among other attractions. In 2013, the parade received a commendation from Hilton Head Island’s Town Council in celebration of its thirtieth anniversary. Parade date and time: Sunday, March 12, 2017, 3 p.m., rain or shine. To join the parade: Enter online at HiltonHeadIreland.org. Click or tap the “Entries” tab, then click or tap the “Enter the Parade Now” button. Entry fees are $325 for businesses and $150 for non-profit organizations. To volunteer: Volunteers are needed to help in the staging area and along the parade route. Volunteer online at HiltonHeadIreland.org. Click or tap the “Volunteer” tab. Or contact Bill Harper at (843) 616-3604 or e-mail Bill@HiltonHeadIreland.org.